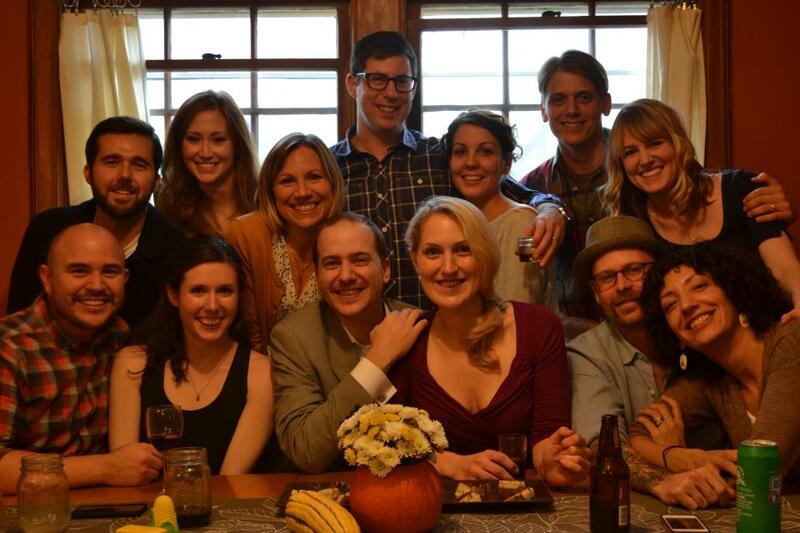 This year was my third year to host Friendsgiving here in Kansas City. The first year, we had 11 friends and no kids gather in our small home and bring an amazing assortment of food…including jello shots. Over the years, some friends have moved away and others have moved in. We love welcoming new friends into our hearts and home. 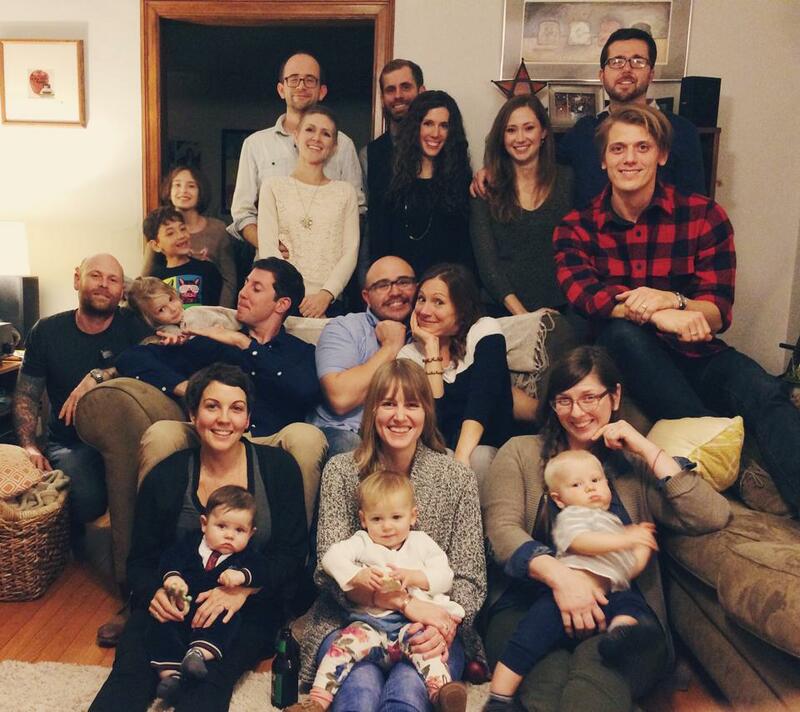 This year was much bigger with 15 adults and six children, as many of our friends have become parents. No jello shots this year. Womp Womp. Although the dynamic was slightly different, the joy and love was tremendous. Time management is key to hosting a low stress and enjoyable holiday party. By organizing my dishes and using slow cooking techniques, I was able to enjoy the beautiful day and amazing friends that came to our home. I spent the day preparing for a full house in my tiny space. Since my kitchen and my oven is quite small, I chose to roast a 7-lb pork shoulder in a roasting oven (life saver), roast a 4-lb free range chicken in my oven, and cook my cornbread dressing in my slow cooker. During the great cooking adventure, I did lose a breaker and a fuse a few times (and ended up placing my slow cooker with the cornbread dressing in a spare bedroom!). But it all turned out great and I kept my wine glass FULL. 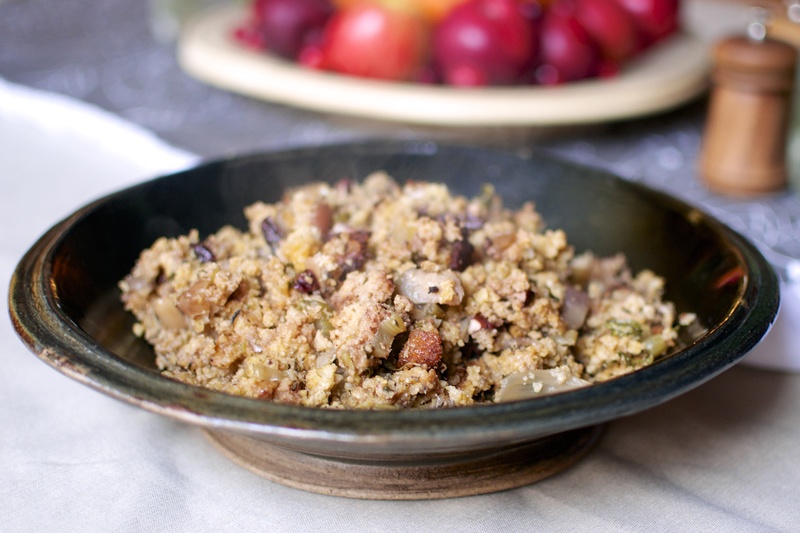 So let’s get to this Cornbread Dressing, shall we? 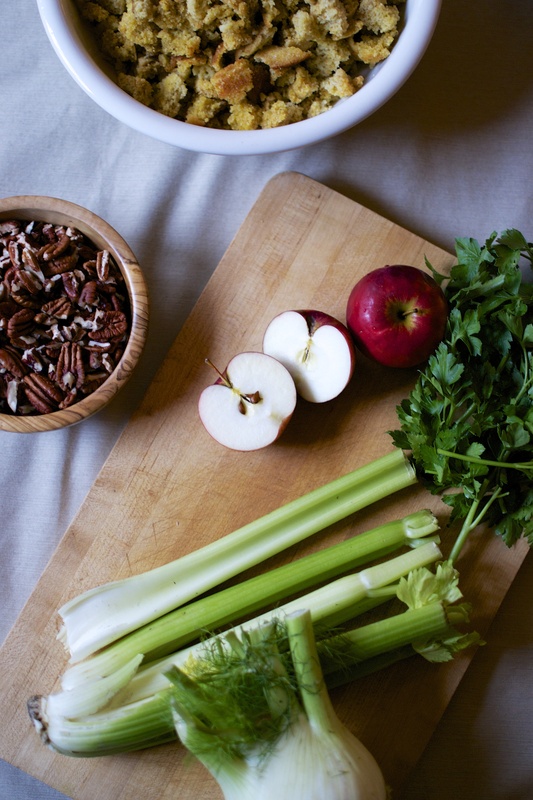 Apples, Fennel, and Pecans! Yeeeeeeaaaas. And don’t forget sage! 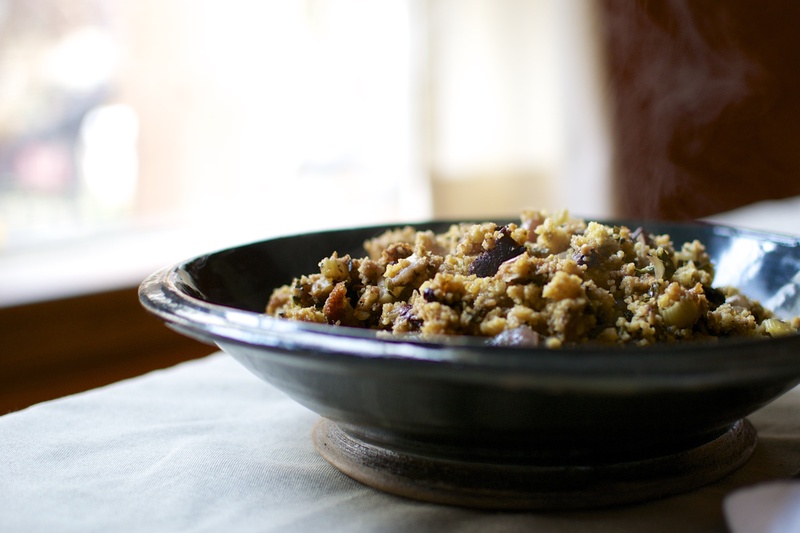 There are several parts of this dressing that can be made ahead of time. The Gluten Free Old Fashioned Cornbread can be made up to 2 days ahead. The aromatics in the dish (onions, celery, and fennel) can be braised in a little olive oil up to two days ahead of time as well. I mixed everything together and placed into my slow cooker and allowed to cook while I was getting other things together. This also kept the cornbread dressing warm until it was time to eat. Prepare cornbread at least one day ahead of time. Crumble up cornbread and place on a rimmed baking sheet. Allow to sit out at room temperature and dry out. Alternately, preheat oven to 250F and scatter cornbread in a single layer on the rimmed baking sheet and bake (stirring often) for about 1 hour or until the cornbread is dried out. Heat olive oil in a large skillet over medium-high heat. Add fennel, onion, and celery and cook, stirring often, and beginning to soften. Add apple, pecans, and herbs. Cook for about 1 minute. Remove from heat and gently stir in dried out cornbread and 1 1/2 cups of broth. Add salt and pepper to taste. 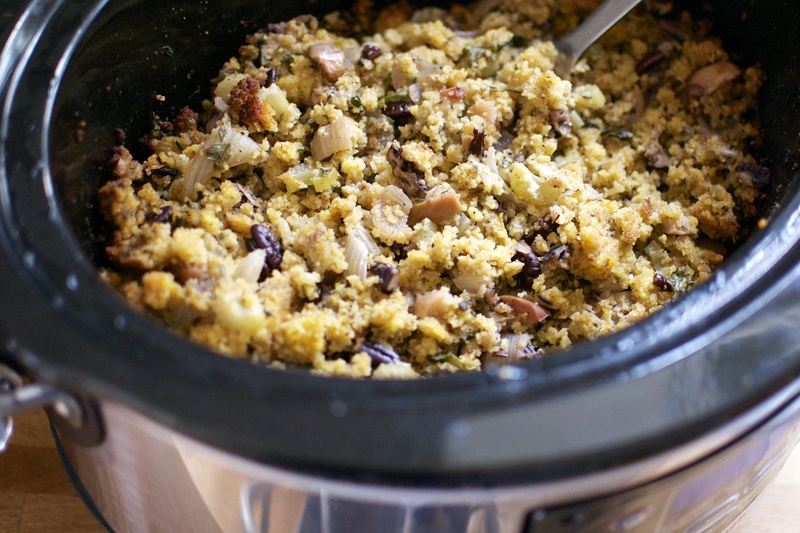 Spoon cornbread dressing mixture into a large slow cooker or crock pot. Cook on low for about 4 hours. Keep warm until ready to serve. such a fun day with great food! !